Wash and rinse canning jars; keep hot until ready to use. Prepare lids according to manufacturer's directions. 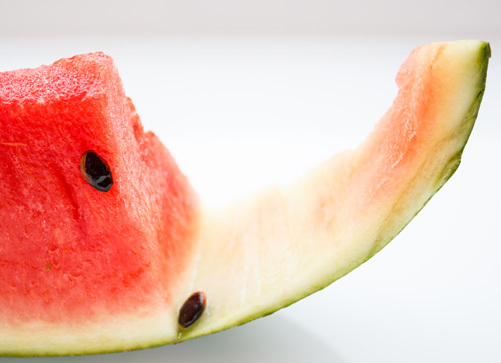 Trim the pink flesh and outer green skin from thick watermelon rind. Cut into 1 inch squares or fancy shapes as desired. Cover with brine made by mixing the salt with 3 quarts cold water. Add ice cubes. Let stand 3 to 4 hours. Drain; rinse in cold water. Cover with cold water and cook until fork tender, about 10 minutes (do not overcook). Drain. Combine sugar, vinegar, water, and spices (tied in a clean, thin, white cloth). Boil 5 minutes and pour over the watermelon; add lemon slices. Let stand overnight in the refrigerator. Heat watermelon in syrup to boiling and cook slowly 1 hour. Pack hot pickles loosely into clean, hot pint jars. To each jar add 1 piece of stick cinnamon from spice bag; cover with boiling syrup, leaving ½ inch headspace. Process jars immediately in a boiling water canner according to the recommendations. Let cool, undisturbed, 12-24 hours and check for seals. Source: So Easy to Preserve, 5th ed, 2006.